The strip's original title was A. Mutt (the initial stood for Augustus). The character had previously been spotted in Fisher's sports cartoons, but wasn't named until the strip began. The name may, as some comics historians say, have been chosen to signify his position in the household hierarchy, i.e., analogous to that of the family pooch; or it may, say others, have been short for "muttonhead". Mutt enjoyed gambling at the racetrack (which is why, like Fisher's earlier work, the strip appeared in the sports section, back before daily papers had comics pages), but had to answer to his shrewish wife for this avocation. If the strip had remained tied to that setting, it would probably have run its course in a few years and been as thoroughly forgotten as the Briggs work is today. But in on March 27, 1908, tall, skinny Mutt met the diminutive Jeff, and the series began to transcend its limited venue. Mutt's easygoing dimwittedness contrasted to great comic effect with the fact that Jeff was certifiably insane (they first met in a mental institution). 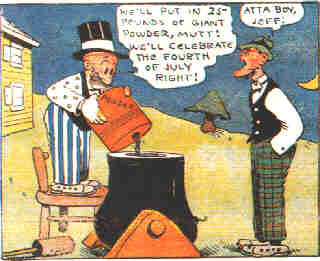 Its scope broadened immensely (in fact, later that year, Mutt became the very first toon candidate for U.S. president), and before long "Mutt & Jeff" actually became a part of the English language, a slang term for a tall person paired with a short one. Fisher hadn't been doing the feature long before William Randolph Hearst hired him away, and he began doing it for Hearst's San Francisco Examiner, instead. The Chronicle tried to continue it with another artist, but Fisher had taken the precaution of copyrighting it in his own name, and The Chronicle was forced to stop. It was soon appearing in Hearst papers nationwide, and was also distributed by King Features Syndicate soon as that Hearst subsidiary got off the ground. In 1913, Fisher moved it to The Wheeler Syndicate (later known as Bell Syndicate). King tried to prevent the move, but again, Fisher succeeded in asserting his ownership rights. By this time, Fisher was relying more on his assistants than his own work, and spent most of his time enjoying the huge amounts of money the strip earned for him. In fact, his first shot at an animated version fell through because animator Paul Terry was unable to get him to sit still and work on getting the venture off the ground. Nonetheless, Mutt & Jeff became an early success in animation (the first of hundreds of silent cartoons was released Feb. 10, 1913), which only increased Fisher's wealth, distancing him even further from the strip itself. Of all the "assistants" who wrote and drew Mutt & Jeff, the one who devoted more of his career to it than any other was Al Smith, who took it on in 1932 and stayed until 1980 — only two years before the strip's demise. It was Smith who created the Sunday page's topper, Cicero's Cat, about Mutt's son's pet, which was added in 1933. Smith also toned down the domestic strife, humanizing Mrs. Mutt to broaden the strip's family appeal. Although he was solely responsible for writing and drawing Mutt & Jeff, it was not until 1954, when Fisher died, that Smith started signing his own name to it. Mutt & Jeff also had a lengthy, if low-key, career in comic books. They were prominently featured on the cover of Famous Funnies #1, the first comic book in the modern format; but during the late 1930s they appeared mostly in the back pages of several strip reprint comics. They found a lasting berth in DC's All-American Comics, where, starting in the first issue, they were among several newspaper comics scattered among the non-reprinted features. DC gave them their own comic in 1939 (simultaneous with doing the same for their own Superman). They continued publishing it until 1958, when it was taken over by Dell Comics. Dell published it for only a year before handing it over to Harvey, which published it until 1965. After the comic book ended, Mutt & Jeff continued as a newspaper feature for another 17 years. But in 1982, after an impressive 75-year run — and having outlasted even the long-enduring tenure of Al Smith — the strip was finally laid to rest. Today, there are no definitive reprint editions, nor is the feature a merchandising bonanza. There aren't even very many devoted fans to lament the passing of what had by then become rather an old-fashioned series. But its place in the history of comics is secure. Text ©2000-06 Donald D. Markstein. Art © H.C. Fisher.